One of my constituents contacted me about the closure of the Wildlife Club run by Dundee Countryside Rangers. He drew my attention to the Facebook page of Dundee Ranger Service. On the 7 March, a reduction in activities including the closure of the Nature Club was announced. "Some of you have been asking about the summer events programme for 2016. 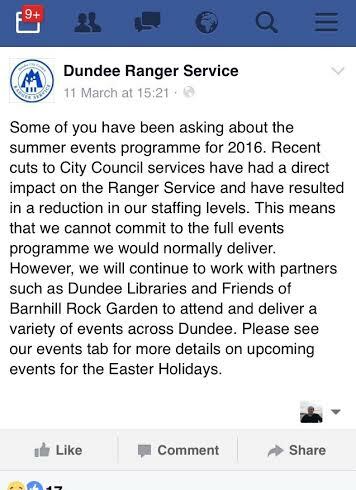 Recent cuts to City Council services have had a direct impact on the Ranger Service and have resulted in a reduction in our staffing levels. This means that we cannot commit to the full events programme we would normally deliver. However, we will continue to work with partners such as Dundee Libraries and Friends of Barnhill Rock Garden to attend and deliver a variety of events across Dundee. Please see our events tab for more details on upcoming events for the Easter Holidays." "We too are gutted that our wildlife club will no longer be able to happen. So grateful my two children (children's first names omitted) had the opportunity to be part of it." Another wrote: "That's very sad as we as a family and my sister and her kids often come to your events." "Oh no! My two boys love coming to your activities." It is a matter of deep regret that budget cuts have led to fewer Countryside Rangers. They provide a range of valued services in our communities. Developing a love of wildlife and an experience of getting out in our parks and open spaces is important, especially when it helps to prise our young people away from their screens and get them outdoors. It is counterproductive to make these cutbacks. 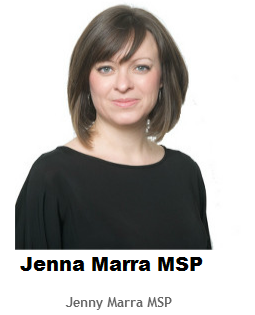 It is yet another example of the way services valued by the public are being whittled away by budget reductions year after year. These are short term cuts that are already damaging these front line services. Is 20 Plenty for Broughty Ferry?